On the one hand, there are signs that spring is peeping through. The snowdrops have been up for a couple of weeks and the daffodils are starting to show. The woods are thick with the first bluebell shoots and the catkins are out on the hazels. On the other hand, the weather is still distinctly wintry. Saturday’s heavy rain gave way to a fine misty drizzle today. It’s been a dark, cold and gloomy day. I spent some time this morning starting to tidy up the vegetable garden, beginning the transformation from soggy, chicken-ravaged wilderness to productive veg patch. Speaking of chickens, I clipped their wings today to try to put an end to a recent spate of escapes (the ungrateful little minxes have everything they want – loads of space, a whole vegetable garden to scratch in and a lovely coop, and they still persist in escaping) and – avert your eyes, gentle reader – I set traps for the rats. Where there are chickens, there are rats. They live in my compost bins and flourish and grow fat on the leftover chicken feed. Despite my recent chivalry towards the rat that the cat brought in, I need to control their numbers. Let’s not be squeamish about it. In the afternoon I was on parenting duty, so it was on with the backpack baby carrier and off to the wood. I thought I’d follow my own advice about this being a good time of year for sett surveys and see what else was happening. We walked to the far end of the wood, through the dark, mist-dripping trees, to the Beech Tree sett. This was much easier to see without the summer bracken, but to my disappointment there were no signs of recent use. There were no signs of disturbance (i.e. it had not been dug out or blocked), but it did not look at all badgery. The footpaths in the wood showed clear badger tracks, the badger paths looked well-used (although they are also used by deer, so this isn’t a definite sign) and I was even able to track a badger through the muddy pasture on the far side of the wood and up a farm track. But the Beech Tree sett itself was apparently unused. I’m beginning to doubt myself now. I’ve only ever watched this sett a couple of times, and I’ve never actually seen a badger come out. Perhaps it isn’t a badger sett at all? Perhaps it’s been unused for a while? If it isn’t an active sett then there must be one close by that is. There’s far too much evidence of badger activity for there not to be, and the location is right for my territory map. As ever, the badgers have got me confused. I think I need to take a few more walks up to the wood before the summer to see if I can either see some activity at the Beech Tree or track down another sett. It does seem to be a funny start to spring, we’ve had the Snowdrops in bloom for well over a week and all around there are signs of bulbs pushing their shoots trough damp earth. 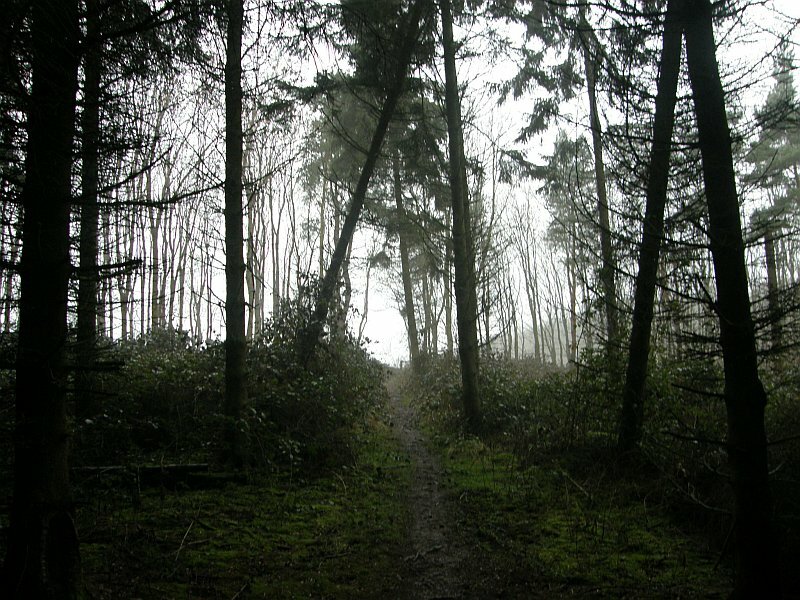 But your photo does capture the same mood that I feel when on the trails on the Clwydian range, dank and brooding. I’ve come across a hole at the base of a tree the other day whilst checking out some stands of Blackthorn for a stick, and once I’ve loaded the pics into my PC I’ll e-mail you one. I don’t think for one minute that it’s badger, although it’s too large for rabbit and yet very close to a lot of fresh rabbit scrapes in the bank. I cannot see any tracks, although that doesn’t mean that there not there! You’ve also reminded me that it’s time for me to see what small crops I can grow this year in my minuscule back yard. Yes, dank and brooding does sum it up well. Hopefully there’s warmer weather on the way, although there is snow forecast for this week!